When you think of women’s health and wellness, you might think of those stereotypical images. It’s hard to miss them, especially on social media. Health and wellness (including everything from food to fitness and activewear) all looks identically picture perfect. You might see a perfectly proportioned woman who is perfectly poised on a perfectly positioned yoga mat. She might be on top of a mountain or at the beach on a perfect day, beside a perfectly arranged acai bowl or perfectly garnished green juice. Don’t get me wrong. I love those sorts of images. The photography is beautiful and I have a lot of respect for healthy, fit bodies. It takes serious dedication to achieve what some of those women do. Plus, those sorts of images can even offer a little inspo (inspiration) on days when being active is harder. Not because I want to look like that but because I know it reminds me how friggin’ awesome active living feels – even my imperfect version. But I also know they’re just images and every detail, down to the last spinach leaf, the last strand of hair or the last bead of sweat has been styled to perfection. Unfortunately, not everybody realises that they’re just images. The green juice tide is turning. Rather than prompting us to be active, perfect stereotypes of what health and wellness should look like could actually be having a considerable impact women’s body confidence, making us less active. Considering that other western countries tend to follow similar trends, that’s potentially a lot of very unhealthy women around the world. Stereotyping health and wellness leaves no room for diversity (the real kind, not the token kind). All of the images and the respective brands, despite their good intentions, just blend into one same-y vanilla blob on your news feed. It just gets a bit… meh… boring. Everyone and everything just looks *yawn* the same. Where’s the diversity that resonates with you and I? Plus what if you or your plate do not look like that? The lack of diversity distorts what health and wellness is really about. Vitality, moving, happiness, nourishing, energy and whatever else it means to you. Ok so kids aren’t an imperfection but they can make it hard to find time for a run! At this point I should really add a little background note about branding, marketing and all that jazz. I’ve spent years working in advertising and related fields. Developing campaigns, shaping or reshaping brand strategies and attending photoshoots was (and still is to a lesser degree) just part of the job. My point is, I completely understand why a business would opt for a well-styled image that presents their product in the best light. There are certain realities of health and wellness that are not inspiring and aspirational (my recently strained calf muscle and the green smoothie stains on my gym shirt right now, for example). The health and wellness industry has expanded at a rapid rate over the last several years, says Marcus Pearce, CEO of The Wellness Couch – Australia’s largest health and lifestyle podcast network. In fact, another study by the Global Wellness Institute found that the wellness industry is worth $3.4 trillion globally. Making it three times larger than the worldwide pharmaceuticals industry. More and more women are realising the benefits of a lifestyle that prioritises health and wellness, which I absolutely love! What I don’t love so much is that the representation of women’s health and wellness is one big unrealistic stereotype. The ‘type’ of images aren’t so much the problem – I love a beautiful Instagram post as much as the next person. The problem is that they’re the only type. It seems that in an attempt to get more people into health and wellness, some brands may actually be doing it (health and wellness) a disservice and having the opposite effect. Stereotypes around the perfect way to eat or exercise could actually be scaring people away from, health and wellness because they fear not fitting the perfect stereotype. Angel Sinclair, the CEO of UK based Models of Diversity would also like to see more brands embrace diversity to better reflect the diversity we see in society. She believes a lack of diversity in the promotions of women’s health and wellness brands could certainly be leading to poor body confidence. Above: Health, wellness and imperfection. So what does any of this have to do with me? Very simply, I want to play an active part in reversing statistics like the earlier one (75% of women not exercising for fear of judgement). I’ve got a long history in business strategies, branding, health and women’s issues – having previously written two books about media literacy and body image. Plus, my background in communications has meant that I had a natural interest in brand strategy and key messaging (I know I sound like a total nerd but I’m afraid it’s true and I totally geek-out on this stuff). So what happens when the marketing and the mission statement don’t align? When promotions don’t fit the philosophy it gets a bit… err… awkward. Instead of just writing about the problem, I wanted to be part of the solution. So the results are scattered throughout this post. An imperfect body that is perfectly happy in the health and wellness space. Above: Health and wellness my way. It doesn’t fit the stereotype but it works for me. I should probably tell you a little bit more about myself and put some of what I’m saying into context. On paper, my health and wellness regime looks alright. I was heavily involved with sport from a young age and later played with a number of representative teams both here and overseas. I used to love nothing more than going for a run, climbing a rock face or heading to the gym regularly. All in all, that sounds relatively typical of someone into health and wellness, right? Yeah… ummm… there’s more to it than that. In reality, neither my body nor my health and wellness regime are perfect or stereotypical. But I’m ok with that. I’m used to the curious looks I get when shopping for activewear or exercise equipment in my wheelchair. But my health and wellness is a greater priority to me than the opinion and validation of others. 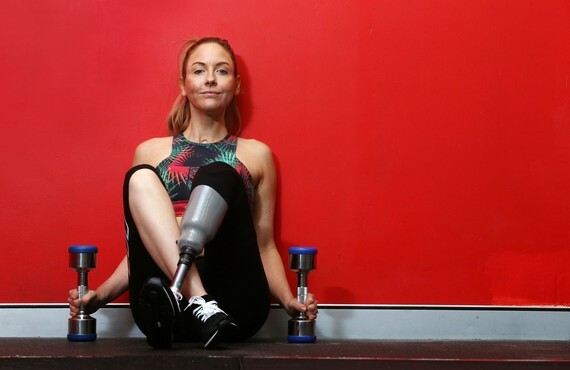 Due to illness and permanent disabilities, I can no longer run, let alone walk and I clamber on gym equipment like a baby giraffe taking its first wobbly steps (you can read more about that here). I’ve been doing that for years, getting plenty of raised eyebrows in the process. Although I’m pretty happy to be moving – anywhere – because uncoordinated wobbles are so much more than I could do for a long while. When my original version of active living came to an abrupt halt in 2005, I could move little more than my hands and swivel my head. Since then, I’ve had to redefine health and wellness for myself. Just like before, it still involves lots of active living, just in a different way. I can’t do much but I do what I can. It’s my own version of active living. It doesn’t fit the stereotype of how women’s health and wellness should look but I couldn’t give a sweaty gym towel about that. And that’s what I encourage you to do. Find YOUR own version of active living. Prioritise your health and wellness with courage and confidence. Like I said before, this isn’t about criticising what’s currently there. This is about showing you another type or version of health and wellness. An ‘imperfect’ version. This is also about encouraging you to appreciate and embrace your perfectly imperfect body whilst being confident enough to prioritise your health and wellness without fear of judgement. I want you to know that you don’t have to look a certain way to find a version of health and wellness that works for you. I also want you to know that you don’t have to prioritise a fear of judgement over prioritising your health and wellness. You might have other reasons not to be active but please don’t let fear of how you look be one of them. Just because you don’t fit the perfect stereotypes that are currently out there, doesn’t make you any less entitled to attain happiness, health and wellness in a way that works for you. Here’s to health, happiness and bed-hair. PS: All photography credits go to the wonderful Tara Croser.